It’s all Uphill from here baby | Help! I live with my Italian mother in law! One thing about living in Genova or for that matter the Ligurian region of Italy, everything seems to be uphill. Recently, I have been on the hunt for an apartment. Yep, you guessed it, I am finally breaking free from Mama! My hope was that this year I would make the house in the country my permanent home but that has proven to be too expensive. I work only a few hours a day teaching and the cost of gas and time it would take to get to the city would not justify the cost. Not to mention that although it is beautiful up there it would be too isolating for me to be there alone most of the year ’round. Since I have been searching, I have found myself counting stairs. Yes, there are a few places to live here at “ground level”, but not many. It has literally come down to the number of stairs I would have to climb! I recently found a sweet apartment right at the half way point of the Sant’Anna scalinata. At first glance there seems to be no end to where these stairs will go. In fact there is a Funiculare that follows the same route for those who can’t be bothered to walk them, but unfortunately it doesn’t stop half way up, because frankly in Genova these stairs could go quite a ways up I assure you. Now if anyone follows my blog you will remember my recent rescue from a similar “Funiculare” in Lago Maggiore, so I am of course back to the reasons why I have recently been counting stairs. I have counted 60 steps to get up to the house in the countryside. This is not including the short hike up the driveway first. I lost count after 75 steps the other night when I was returning home to Mama’s. My point is, when I first looked at the amount of steps this new apartment proposed I was thinking no way, it’s too many, then I realized that in fact just because the staircase has a fancy name like “Sant’Anna” which literally means “Saint Anna” doesn’t mean that the many steps I have already been trekking up and down for the several years don’t count! One thing I’m sure of is if I continue to live here I will never need to buy a stair-master! This entry was posted in Italian Culture, Mama, travel and tagged genoa, Genova, Italy. Bookmark the permalink. Now that almost sounds worse than some churches I have been in. I guess that they want you to work off all of that good wine and rich pasta you eat. You would come to live quite near to me, you know:-)? 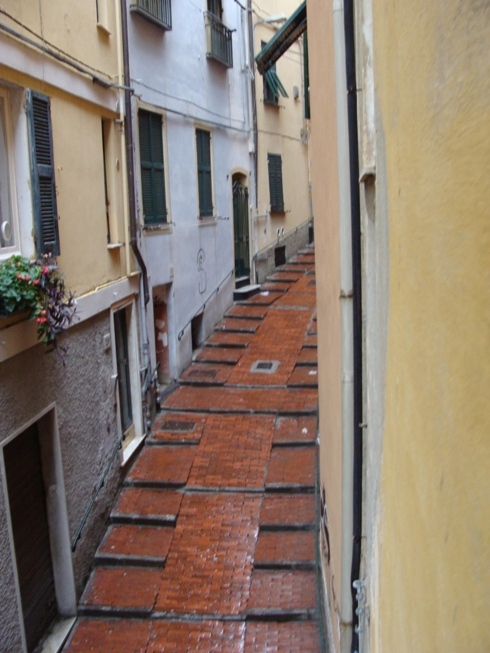 I like that narrow street, it’s a lovely place…and you could consider to use the funicolare, and go to the top of Salita Sant’Anna and then go down to your house…Did you try this way? I have been in that area a few years ago and don’t remember what’s at the top! I was going to take a trip up there this weekend to check it out. Are you free Saturday? Maybe we can go to that museum you mentioned before? I love the area around Salita S.Anna…and it’s not far from where I work. 🙂 Maybe we could meet up more often. I love on the top of a hill, I walk up a creuza (that’s the Ligurian/Genoese term for those uphill paths) like Salita S.Anna at least twice a day, every single day. So I hear you on that. Mal comune, mezzo gaudio (a pain shared is a pain halved) as they say. Wow, my father live in Salita S. Barnaba… very close to S. Anna… NICE AREA Leah!